I am sorry to say it, but I have been overwhelmingly unenthused with new Ferraris lately. They all look vaguely the same to me, with different holes and vents cut into their faces and trailing headlights that look like a person pulling their eyes up at the corners. 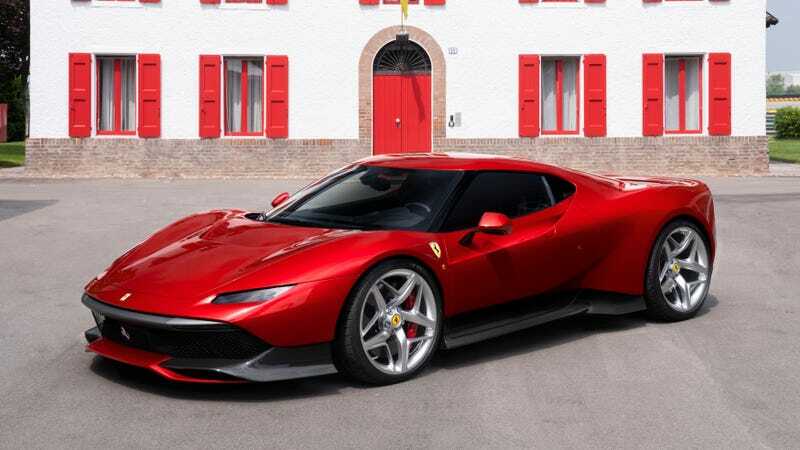 But this new one-off Ferrari SP38? This is something I’d like to see more of. Underneath, it’s the chassis, running gear and twin-turbo V8 of the 488. But riding on top of all that is an all-new body. The side air scoops of the 488 have been covered up. Rear visibility seems incredibly poor, thanks to the three slats that now cover the engine. In fact, the whole thing looks like a bigger Lotus Evora. The lines and proportions are extremely similar. This isn’t a bad thing. Ferrari says that the SP38 was a project that it completed for one of its “most dedicated customers” because of course it was. Personally, I buy all of my Ferraris anonymously using secret Wal-Mart shoppers, so I quite understand that I wasn’t considered when the company was dreaming up this one-off.